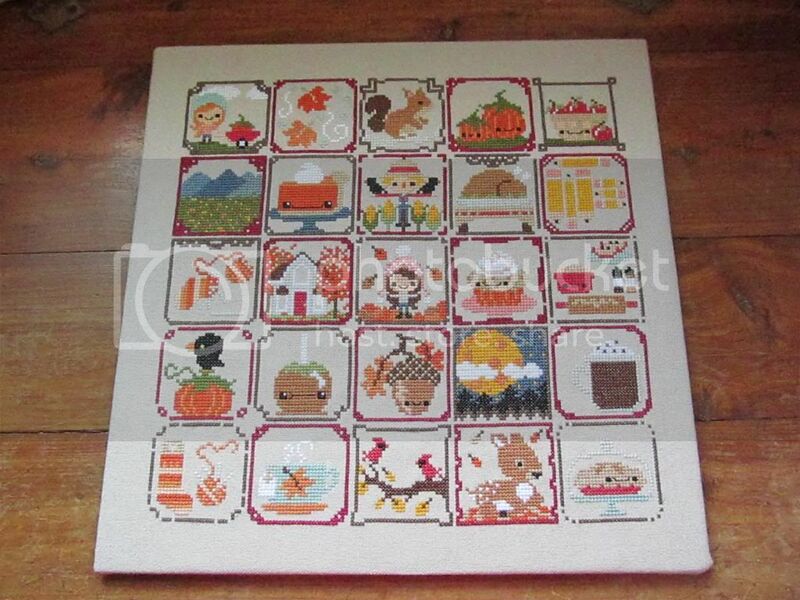 Wool and Wheel: Autumn cross stitch sampler. Fall is my favorite season...I'm sure I've said that a thousand times before. But this fall has been especially good. It's like somehow October and November have included all of the best, most quintessential fall things. Beautiful leaves. My favorite color is yellow and it seems like yellow is everywhere this time of year. Yellows and oranges and reds and browns: cozy colors. The smell of leaves (leaves smell so good!) and wood smoke. Day trips to the mountains and folklife festivals and eating fudge and funnel cakes. A soundtrack of the Avett Brothers, because between their new album and old favorites, it seems like they're all I've been listening to lately. Glorious sunsets and lots of knitting (new socks!) 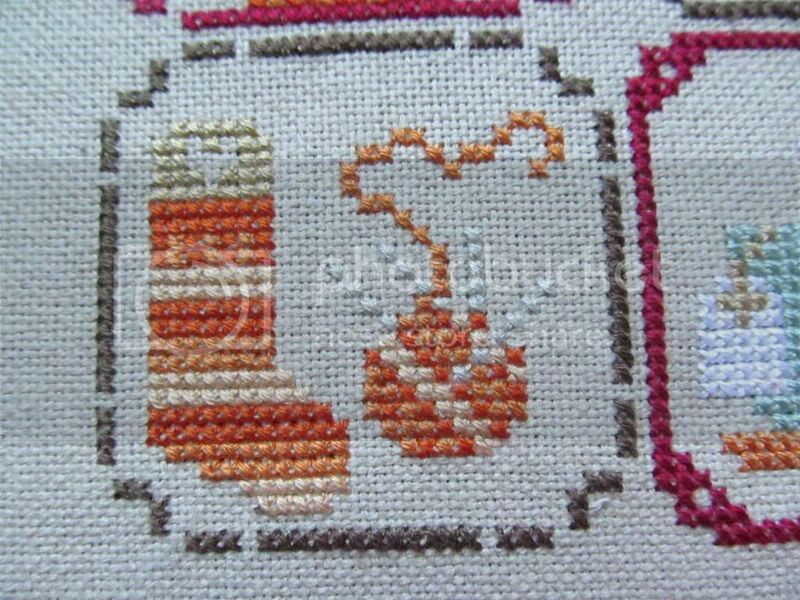 and cross stitching. Pumpkin candles and stacks of books waiting to be read. Huge mugs of hot chocolate with whipped cream and chocolate chips. And there have been new things, too. Like lots of baby holding. A baby girl who pouts and smiles while she's sleeping and who already wears the hat her auntie knit her (though it's not like she has much choice at two and a half weeks old. But this is only the beginning, sweet girl! I'll make you anything you ask for). 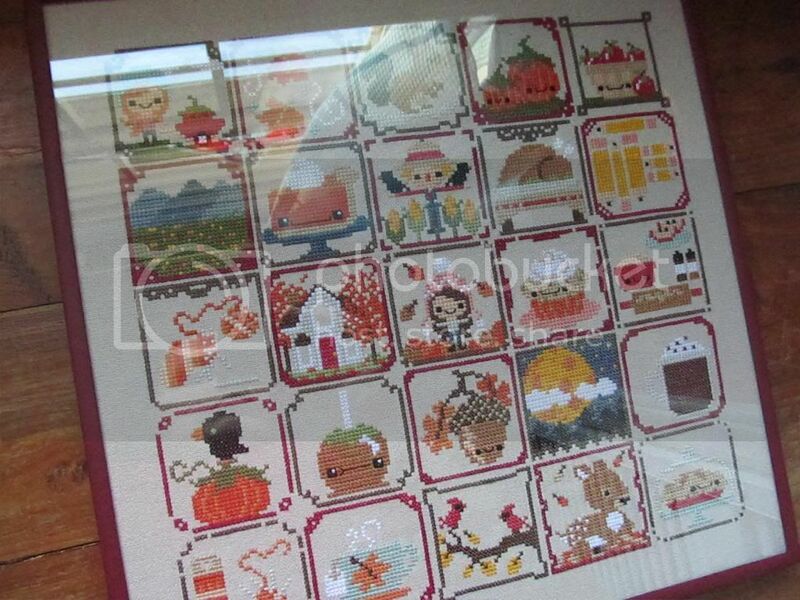 This is the Frosted Pumpkin Stitchery's Autumn Sampler. It was my first time doing anything like this...I signed up early, and at first you only get the patterns for the 25 frames. Then, once a week from the end of September to the end of October, they send you the patterns for five squares. 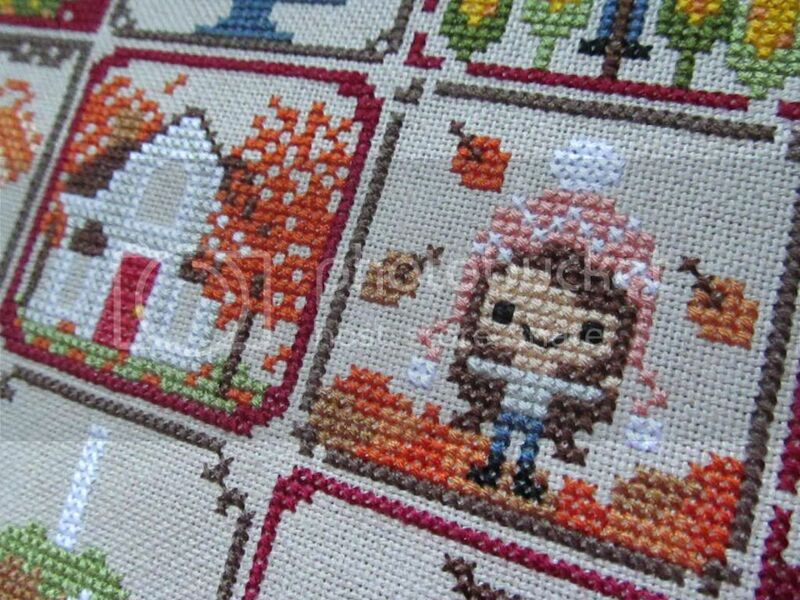 I looked forward to Monday mornings because it was such a nice surprise to open up my email and see what little fall scenes I'd be stitching that week! 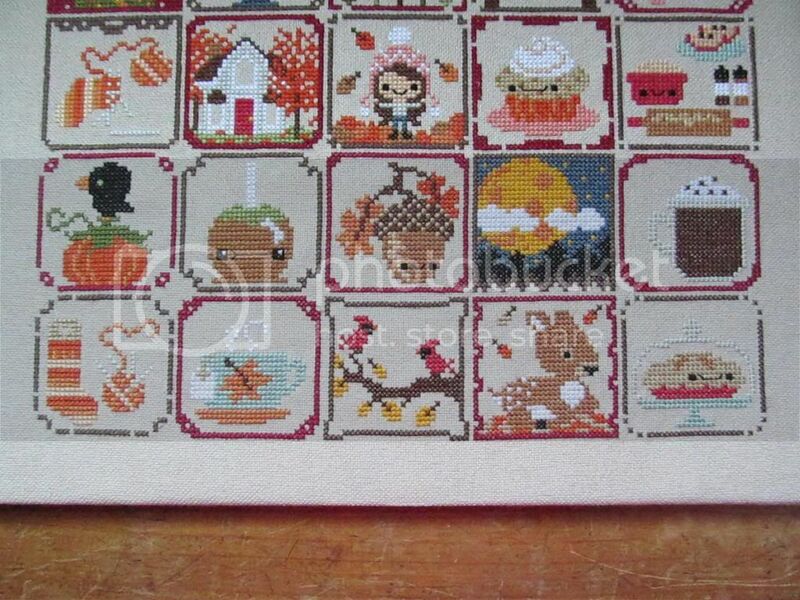 It seems like I worked on this sampler for such a long time. :) I tried to average one square every evening because I wanted to keep up each week, but towards the end I got a bit behind. I had forgotten how time-consuming cross stitching is! But I like how orderly and repetitive it is, and I love seeing how a lot of tiny squares come together to form an image. I did make a few small changes to the pattern. The biggest one is that in the original pattern, each square is numbered. I thought that made it look like a calendar, but then it didn't make sense because there aren't just 25 days in any month, of course! :) So I left out the numbers, and then I had to make slight changes to a few squares because there was an odd empty space without the numbers. For example, I rearranged the pencils a bit and made one of the trees taller in the house one. The rest of the changes I made were just personal preferences: I changed the circular needles in the sock scenes to DPNs because when I knit socks I use those instead of a circular. I changed the pumpkin spice latte to hot chocolate because I don't drink coffee (and I don't like pumpkin-flavored things). 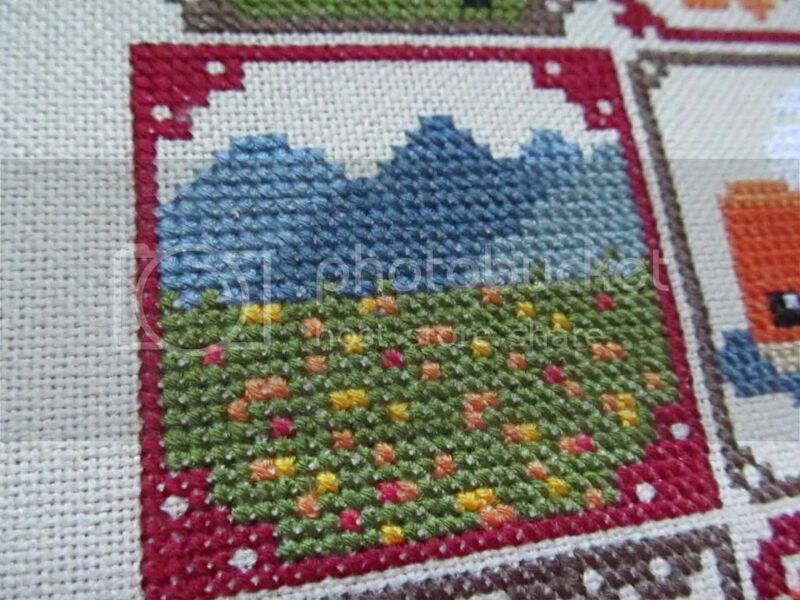 And I added in the mountains square. There was originally a pomegranate there, and since I've never tasted one in my life, I felt a bit odd stitching one. Fall always makes me think of the day trip that my family takes into the Blue Ridge Mountains and riding on the parkway, so I decided to stitch in some of those mountains. :) I love how the actual mountains turned out, but my attempt at the fall foliage in the trees is a bit iffy. Oh, well. By the way, I'm normally not too crazy about the whole kawaii thing in embroidery...you know, lots of faces on everything? But somehow I didn't mind it here. 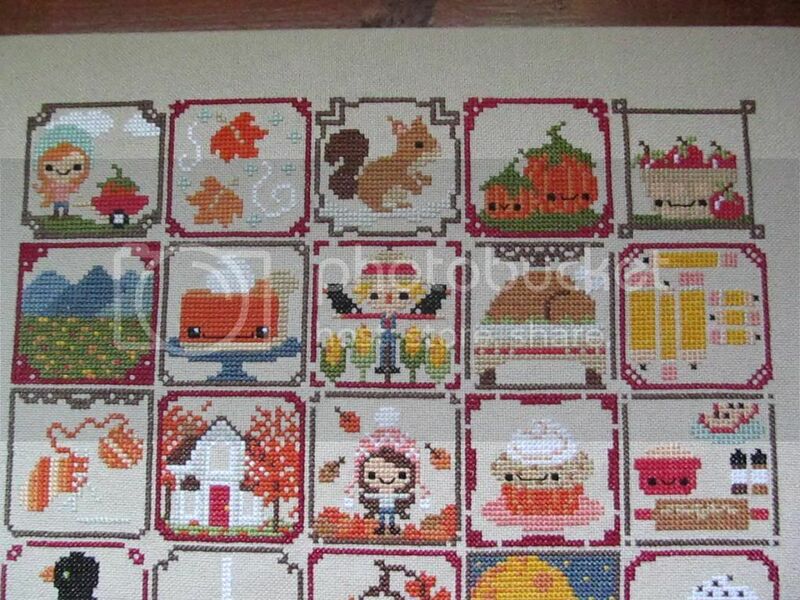 There are a lot of cute little faces, on the pumpkin pie and the basket of apples and the acorn, etc. I could have left them off, but I ended up rather liking them! I'm so happy with my sampler! It was definitely a fun experience and the pattern was adorable and well-made. I'll definitely be stitching up more designs from the Frosted Pumpkin Stitchery in the future. The sneak peeks of their new Christmas patterns look ridiculously cute, especially the Christmas on Gingerbread Lane one! I might make that one someday, though I can't imagine ever being able to do it at Christmas time (unless I had miraculously finished all of my gift-making very early!). And now I guess it'll be feeling like Christmas soon! I used to put up my tree and decorations on November 1st, but over the past couple of years I've gotten in the habit of waiting until exactly halfway through the month: November 15th, which will be this Friday. Though I've been really enjoying this fall, it seems like it passed by quickly, so I wasn't sure that I'd be in a Christmas mood by then. But I've started working on handmade Christmas gifts. The stores I visit most often (Target and Hobby Lobby :) are getting very festive. Mom has been buying new lights for the tree, and I finally bought Elf and The Santa Clause on DVD the other week (I'd only had them on VHS up until now). So cute! I think it looks better without the numbers added. 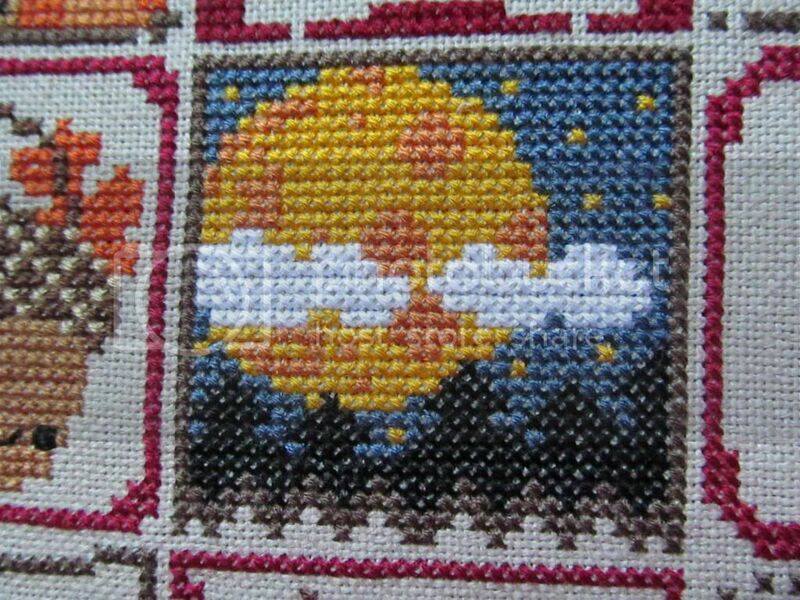 Fall is my favorite as well, so I'd love to stitch up something like that, but I'm really bad at finishing cross-stitch projects.